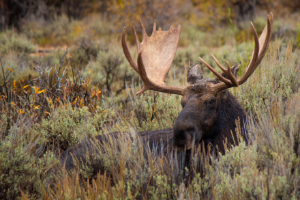 Unit BLACKFEET INDIAN RESERVATION for moose covers approximately 1,535,506 acres, and limited sections of this unit are comprised of public land. The dominant land cover for Unit BLACKFEET INDIAN RESERVATION is grassland/herbaceous. From September through December, this unit receives an average of 1.06 inches of precipitation a month and the heaviest rainfall is in September. Temperatures during hunting seasons typically range from 20°F to 51°F.